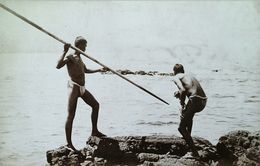 Living in a benign climate, Hawaiian requirements for shelter and clothing were minimal. The basic garments were a malo, or loincloth, for men, a pa`u, or skirt, for women and a rectangular shawl or kihei for both. All were made of kapa, a barkcloth made from wauke, mamaki, oloa, `akala, or hau plant fibers. While kapa is produced throughout Polynesia and the first settlers brought wauke plants (paper mulberry) with them, as Hawaiian kapa evolved, its quality surpassed that of any other region. Kapa in Hawai`i displayed a wide variety of textures, weights and designs. Hawaiians used a number of unique techniques including producing watermarks with patterned beaters, printing designs with bamboo stamps, achieving greens and blues with vegetable dyes and beating perfumed flora into the cloth to impart a fragrance. At least 68 individual types of kapa were produced, each with a specific name. Kapa was used for many things other than clothing, including bedding or sheet material and as banners or as wrapping material. Other garments included the kihei, a type of cloak worn over one shoulder. Ti leaf capes provided protection against cold or rain. Ali`i wore feather capes, cloaks, helmets and lei as signs of rank and status. Made from the feathers of hundreds or thousands of birds attached to a mesh backing, feather garments used striking geometric patterns, most often in yellow and red. Since only a few feathers were taken from each bird caught (the live bird was then released), gathering the feathers for one cape could take decades or even generations.